I’m always interested in new wines, given the burst of wine bars and wine stores in New York City. This month, visitors to New York will be treated to a range of wines that are most likely unfamiliar to most: the Sagrantino wines of Umbria. Throughout April, the Montefalco Consortium will highlight the wines of the Montefalco region in Central Italy with a variety of events throughout the city. Select Montefalco wines, including the wondrous Sagrantino (the jewel of Umbria), will be showcased at Eataly’s Le Eccellenze corner in La Piazza and also by the glass at the various restaurants at Eataly. 200 Fifth Avenue, 212-229-2560, www.eatalyny.com. I got a sneak peek at these wonderful wines at Eataly’s wonderful Manzo (www.eatalyny.com/eat/manzo) restaurant, where I sampled a number of wines not previously known to me but ones that deserve special commendation: the versatile Adanti, Montefalco Rosso, a blend of Sangiovese, Sagrantino and other grapes, nice and smooth and very drinkable with or without food; and five 100% Sagrantinos, tannic in character and very interesting as they opened. Names to remember here were Castelbuono, Perticaia, Caprai, Còlpetrone and Scacciadiavoli (meaning “scrapes the devils”). For dessert, I was completely captivated by Antonelli’s Sagrantino di Montefalco Passito, made from grapes that have been left to dry for at least two months, effecting a sweet yet still tannic wine. Served slightly chilled, it was amazing. I also learned that these red wines are among the healthiest in the world due to this tannic quality, having high resveratrol levels which help protect the heart. I didn’t try any white wines but I’ll be interested in trying Montefalco Bianco, made of Grechetto, Trebbiano Toscano and other grapes. If this wine is as exciting as the reds, it should be another revelation. If you want to experience more of this wine from Umbria, you can participate in classes all month as well as in tastings as I did. Each week this month, winemakers from Montefalco will offer classes at Lidia Bastianich’s La Scuola (www.eatalyny.com/learn) along with free wine tastings at Eataly Vino. Other locations offering free wine tastings with the winemakers include Enoteca of Di Palo’s Fine Foods, Seagrape, Vestry Wines, Morrell and 67wine. 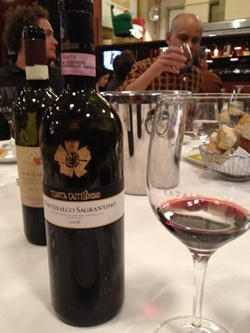 Two ticketed wine classes with the winemaker will be held at La Scuola on April 19 and 26. Ticketed pairing dinners are planned for Felidia, SD26, Trattoria 5 and Bocca. You can see a full schedule of events at www.consorziomontefalco.it and www.colangelopr.com/montefalco. This entry was posted on Sunday, April 8th, 2012 at 11:31 am	and is filed under Stuff to Do. You can follow any responses to this entry through the RSS 2.0 feed. You can leave a response, or trackback from your own site.